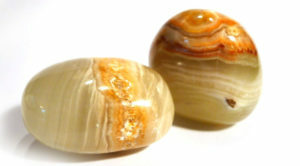 Onyx is a striped variety of agate, displaying flat rather than concentric layering, most commonly in black and white, but also cream to green, and sometimes occurring with layers of sard, when it is known as sardonyx. 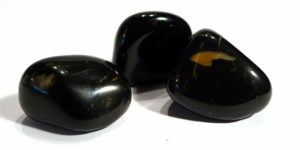 Black onyx without layering is often sold as a tumble stone. It is slightly distinguished from black obsidian by the odd brown, white or clear inclusion. Primary birthstone for Capricorn (22nd December – 19th January), Secondary Birthstone for Leo: Up until 1912, onyx, along with turquoise, was the Leo birthstone. The National Association of Jewellers (US) swapped the stones of the star signs, on the basis that the lighter turquoise was more suitable for wearing in winter months, and this has been accepted practice ever since. Properties: In the past, especially in India, onyx was considered a stone of disharmony, which “cooled the ardours of love”. In modern crystal healing it is employed for protection and grounding, as it calms basic fears to allow a feeling of safety and security, and roots spiritual energy in the body for work on the physical level. It is believed to bestow strength, especially in times of stress, and on a physical level can be beneficial for the eyes, bone marrow, and motor nervous system. It should be worn for long periods, as the benefits can take some time to manifest.